And I “careen” toward you. Because “Aunt Corinne” says it this way. In the post-war ‘40s and ‘50s. My future Mom, to a marriage in the outer suburbs. Two years later, I showed up. My parents both liked the name. Now the world had two of us. In front of Niagara Falls. Our mothers caught up again at Penn reunions. Whenever we heard it was snowing big in Buffalo. We fell off to Christmas cards. And Corinne and I met for the first time as adults. And we were very different people. Made good, in spite of personal challenges. And that we had both done our best with the name. AUTHOR’S NOTE ON THE PHOTOGRAPH: June 1960, Niagara Falls. 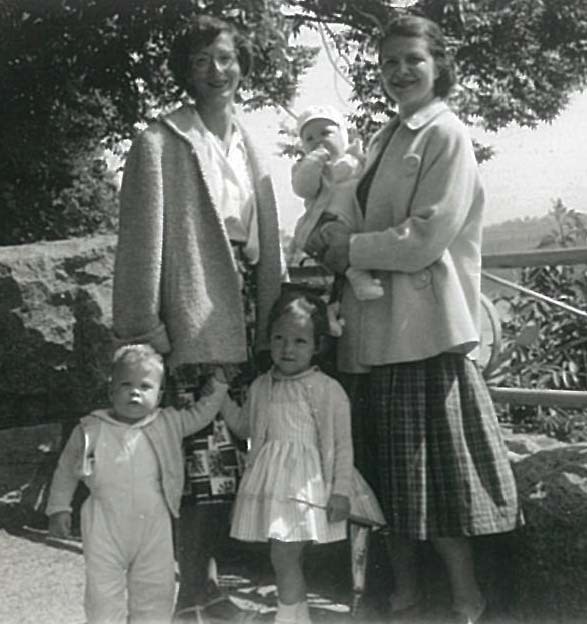 My mother stands on the left, and Corinne is on the right, with David and me in front and baby Bobby in Corinne’s arms. This is the only photo I have with both Corinnes in it. I was two and a half years old. I hope to get a current one this summer. NOTE FROM THE AUTHOR: Having an uncommon name means never finding personalized key fobs or notepads on any gift shop kiosk. Or emitting squeals of surprise and delight, if you do. ABOUT THE AUTHOR: Corinne H. Smith is a writer and a poet who worked as a librarian for more than 30 years. She is the author of Westward I Go Free: Tracing Thoreau’s Last Journey, the first book to follow American author Henry David Thoreau’s 1861 trip from Massachusetts to Minnesota. Her forthcoming book for middle schoolers, Henry David Thoreau for Kids: His Life and Ideas, With 21 Activities, will be published by Chicago Review Press in 2016. She writes memoir and nature pieces as well as book and music reviews for a variety of outlets. She has participated in public poetry readings in both Massachusetts and Pennsylvania. She currently lives in Lancaster County, Pennsylvania. You can catch up with her at www.corinnehsmith.com. how neat that you are named after someone, though having an unusual name can be a problem. My daughter also complains of people constantly spelling her name incorrectly and never being able to buy personalized keychains, etc. Her name is Katarina (though the more common spelling here in Germany is with an “h”– Katharina).